In astronomy, a co-orbital configuration is a configuration of two or more astronomical objects (such as asteroids, moons, or planets) orbiting at the same, or very similar, distance from their primary, i.e. they are in a 1:1 mean-motion resonance. (or 1:−1 if orbiting in opposite directions). There are several classes of co-orbital objects, depending on their point of libration. The most common and best-known class is the trojan, which librates around one of the two stable Lagrangian points (Trojan points), L4 and L5, 60° ahead of and behind the larger body respectively. Another class is the horseshoe orbit, in which objects librate around 180° from the larger body. Objects librating around 0° are called quasi-satellites. An exchange orbit occurs when two co-orbital objects are of similar masses and thus exert a non-negligible influence on each other. The objects can exchange semi-major axes or eccentricities when they approach each other. 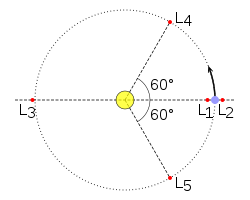 Trojan points are the points labelled L4 and L5, highlighted in red, on the orbital path of the secondary object (blue), around the primary object (yellow). = (±60°, ±60°). The point around which they librate is the same, irrespective of their mass or orbital eccentricity. There are several thousand known trojan minor planets orbiting the Sun. Most of these orbit near Jupiter's Lagrangian points, the traditional Jupiter trojans. As of 2015[update] there are also 13 Neptune trojans, 7 Mars trojans, 2 Uranus trojans (2011 QF99 and 2014 YX49) and 1 Earth trojan (2010 TK7) known to exist. The Saturnian system contains two sets of trojan moons. Both Tethys and Dione have two trojan moons, Telesto and Calypso in Tethys's L4 and L5 respectively, and Helene and Polydeuces in Dione's L4 and L5 respectively. Polydeuces is noticeable for its wide libration: it wanders as far as ±30° from its Lagrangian point and ±2% from its mean orbital radius, along a tadpole orbit in 790 days (288 times its orbital period around Saturn, the same as Dione's). A pair of co-orbital exoplanets was proposed to be orbiting the star Kepler-223, but this was later retracted. The possibility of a trojan planet to Kepler-91b was studied but the conclusion was that the transit-signal was a false-positive. One possibility for the habitable zone is a trojan planet of a giant planet close to its star. According to the giant impact hypothesis, the Moon formed after a collision between two co-orbital objects—Theia, thought to have had about 10% of the mass of Earth (about as massive as Mars), and the proto-Earth—whose orbits were perturbed by other planets, bringing Theia out of its trojan position and causing the collision. Objects in a horseshoe orbit librate around 180° from the primary. Their orbits encompass both equilateral Lagrangian points, i.e. L4 and L5. The Saturnian moons Janus and Epimetheus share their orbits, the difference in semi-major axes being less than either's mean diameter. This means the moon with the smaller semi-major axis will slowly catch up with the other. As it does this, the moons gravitationally tug at each other, increasing the semi-major axis of the moon that has caught up and decreasing that of the other. This reverses their relative positions proportionally to their masses and causes this process to begin anew with the moons' roles reversed. In other words, they effectively swap orbits, ultimately oscillating both about their mass-weighted mean orbit. A small number of asteroids have been found which are co-orbital with Earth. The first of these to be discovered, asteroid 3753 Cruithne, orbits the Sun with a period slightly less than one Earth year, resulting in an orbit that (from the point of view of Earth) appears as a bean-shaped orbit centered on a position ahead of the position of Earth. This orbit slowly moves further ahead of Earth's orbital position. 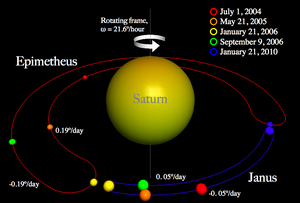 When Cruithne's orbit moves to a position where it trails Earth's position, rather than leading it, the gravitational effect of Earth increases the orbital period, and hence the orbit then begins to lag, returning to the original location. The full cycle from leading to trailing Earth takes 770 years, leading to a horseshoe-shaped movement with respect to Earth. More resonant near-Earth objects (NEOs) have since been discovered. These include 54509 YORP, (85770) 1998 UP1, 2002 AA29, 2010 SO16, 2009 BD, and 2015 SO2 which exist in resonant orbits similar to Cruithne's. 2010 TK7 is the first and so far only identified Earth trojan. Quasi-satellites are co-orbital objects that librate around 0° from the primary. Low-eccentricity quasi-satellite orbits are highly unstable, but for moderate to high eccentricities such orbits can be stable. From a co-rotating perspective the quasi-satellite appears to orbit the primary like a retrograde satellite, although at distances so large that it is not gravitationally bound to it. Two examples of quasi-satellites of the Earth are 2014 OL339 and (469219) 2016 HO3. In addition to swapping semi-major axes like Saturn's moons Epimetheus and Janus, another possibility is to share the same axis, but swap eccentricities instead. ^ Morais, M.H.M. ; F. Namouni (2013). "Asteroids in retrograde resonance with Jupiter and Saturn". Monthly Notices of the Royal Astronomical Society Letters (in press). 436: L30–L34. arXiv:1308.0216. Bibcode:2013MNRAS.436L..30M. doi:10.1093/mnrasl/slt106. ^ "Two planets found sharing one orbit". New Scientist. 24 February 2011. ^ Christou, A. A.; Asher, D. J. (2011). "A long-lived horseshoe companion to the Earth". Monthly Notices of the Royal Astronomical Society. 414 (4): 2965. arXiv:1104.0036. Bibcode:2011MNRAS.414.2965C. doi:10.1111/j.1365-2966.2011.18595.x. ^ Galiazzo, M. A.; Schwarz, R. (2014). "The Hungaria region as a possible source of Trojans and satellites in the inner Solar system". Monthly Notices of the Royal Astronomical Society. 445 (4): 3999. arXiv:1612.00275. Bibcode:2014MNRAS.445.3999G. doi:10.1093/mnras/stu2016. ^ de la Fuente Marcos, Carlos; de la Fuente Marcos, Raúl. "Asteroid 2014 OL339: yet another Earth quasi-satellite". Monthly Notices of the Royal Astronomical Society. 445: 2985–2994. arXiv:1409.5588. Bibcode:2014MNRAS.445.2961D. doi:10.1093/mnras/stu1978. ^ Funk, B. (2010). "Exchange orbits: a possible application to extrasolar planetary systems?". Monthly Notices of the Royal Astronomical Society. 410: 455–460. Bibcode:2011MNRAS.410..455F. doi:10.1111/j.1365-2966.2010.17453.x. Eric B. Ford and Matthew J. Holman (2007). "Using Transit Timing Observations to Search for Trojans of Transiting Extrasolar Planets". The Astrophysical Journal Letters. 664 (1): L51–L54. arXiv:0705.0356. Bibcode:2007ApJ...664L..51F. doi:10.1086/520579.